I have attached a picture containing two column B and C. If my input to this table is 2.3, it should return me row number where my input value is greater than or equal to B column value and less than C column value. Manually for 2.3 it should return the first-row number of the table. Manually for 5.75 it should return the fourth-row number of the table. Vignesh, having two columns is unnecessary (and actually contradictory), since the "next row" of any row in your first column is the upper limit of the preceding row, and since, as you have it now, some values appear on two rows (e.g., 3.5 is currently the upper limit of row 1 and the lower limit of row 2). You only need your first column. Not the answer you're looking for? 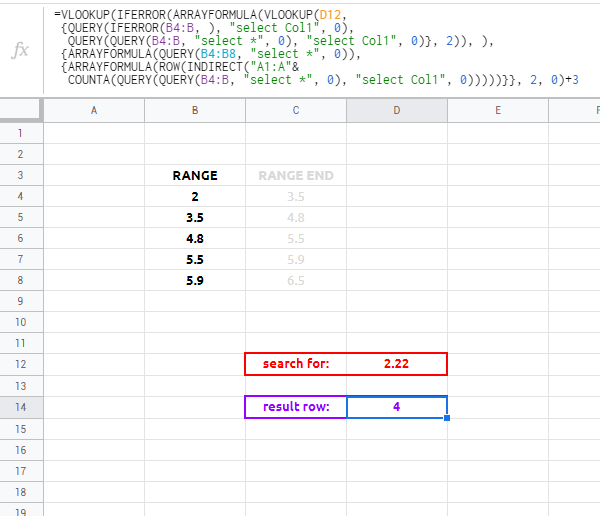 Browse other questions tagged google-sheets formulas google-sheets-query google-sheets-arrayformula vlookup or ask your own question. 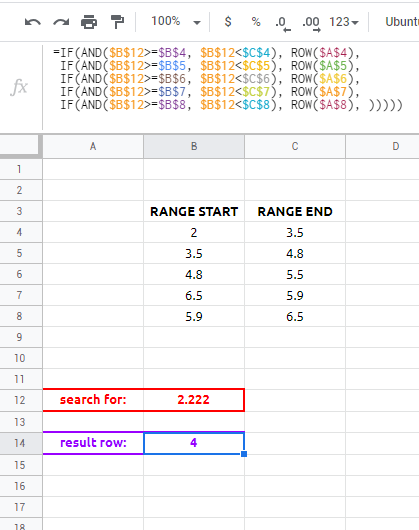 Can Google Spreadsheets conditionally format based on a previous cells content? How to return only the first row containing the value you are searching for in a query? 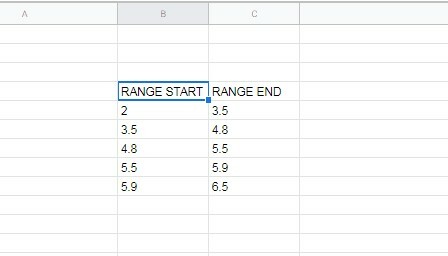 Make each cell in a column update from the same row of another sheet?